What if he’s talking about bitcoin cash, wondered one cryptonian. “Hell no,” was Dorsey’s response. You need eth, someone said. “Nah,” the reply. He said he’s been buying bitcoin at the current levels of about $3,000, but doesn’t consider it as an investment. Instead he thinks it’s a currency. Marketing Gimmick or a Real Bitcoiner? Cryptos have begun grabbing the attention of tech giants, with Facebook potentially looking to launch a token while Google is seemingly looking at making blockchain data searches more easy. Reddit too has entered the fray with a somewhat interesting experiment where karma points are now tradable for eth. Twitter hasn’t revealed anything on that front, with no known plans to launch any blockchain related project or to incorporate any crypto aspect. There’s Cashapp of Square which allows for bitcoin trading, with Dorsey saying they have no plans to add any other coins, but that’s somewhat minor considering potential maneuvers from other tech giants. All suggesting Twitter is a bit behind where the blockchain space is concerned. So Dorsey may well be trying to compensate for it by just talking about bitcoin, so making himself relevant in some ways. It might however be the case that Twitter is now perhaps looking to utilize bitcoin payments in some way, with Dorsey saying they’re paying attention to this potential use case. Dorsey is the only known billionaire to specifically pick one coin and say no to all others. Fred Wilson of Union Square perhaps comes close with his preference for eth, but Wilson does tend to at least pay lip service to bitcoin. Dorsey on the other hand seems to intentionally make it known and somewhat loudly so that he is interested in only bitcoin, but does he really know much about the crypto space? Realistically, Dorsey must be an incredibly busy man. As an example, Twitter was plagued with spam last year and did nothing about it until Jackson Palmer of Doge fame begun sharing a piece of code that resolved the situation pretty quickly by auto blocking spammers. That must have been embarrassing for Twitter, which in addition has been criticized of censorship bias against the so-called alt-right. Amidst all these unfoldings, it is doubtful Dorsey found much time to really understand bitcoin and cryptos in general. So it may be the case he spent a few minutes reading some censored bitcoin spaces and now perhaps he’s just playing to the crowd. Bitcoiners were excited to read Dorsey’s tweets and some thought it was all bullish and may cause a price rise. However, cryptos are in a bear market and, in addition, everyone knows about bitcoin now. Had Dorsey tweeted what he did in 2014, 2016 or even 2017, then it may have been something big. 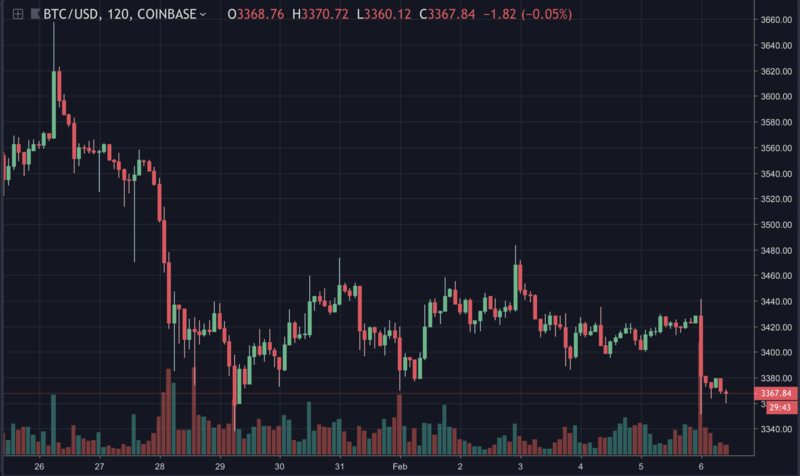 Bitcoin’s price, Feb 6 2019. Unlike other cryptos, bitcoin has passed the awareness stage and now has to provide some utility and some use cases. Just as a hedge like gold might be one application, but gold has been rising while bitcoin has been falling perhaps because you can’t quite compete with gold head to head without offering something more. A new asset in a diversified portfolio might be another use case, but Dorsey considers it to be a currency, rather than an investment. For currency like uses, the Lightning Network will have to be refined considerably more. How long that will take is not known, but theres a race in the crypto space to provide capacity and thus to enable the many use cases. Thus betting on only one coin or one network at this stage might be a bit like betting on just one tech company in the 90s. It might have worked if you were extremely lucky, but the crypto space is still at a very early stage. Making it difficult to predict how it will develop.